Are sword collectors in a trap? 5. Ship back home, after all the agents have charged handling, pay more duties etc. Im going to buy a few dull old swords with cracks in from the murimachi jindai cheapy thanks to the above. Good for you Dave, but what are you gonna do with them? Steps 6a and 7: place cheap item in sword bag, place in drawer and close? Nope, I was thinking more along the lines of cutting round fruit in half that's being thrown at me by nuns. 6 and 7 are the cheapest option. have you some pictures from this swords? Actually the whole reason for me posting this was that I feel we should remain true to the simple things. Armour for me is not about collecting the very best, or what I'm told by others is the very best. The love of katchu is pure, from a cheap zuanri to a saotome. We must never fall into the nihonto trap of perfection as it de-values everything else and confines the collectors market to a game for the rich. Thank you Dave for these clarifications. There is a long time that it's my way to collect even if it happened to me to buy a few beautiful pieces; It was a long time ago where i found objects, as well swords than katchu, at correct prices. It was well before internet. The collector i was did not knew little more than the seller about the quality of the object, but I've always preferred the sober and martial things without foil. Dave ,The process you described is probably the same followed by most sword collectors in the early stages and is best described a paying school fees because there will be many a bitter lesson learned.These days any sword without papers has a good chance of being gimei especially if it is in Japan where the cost of authentication is quick and cheap.Anyone thinking of buying a sword should rather buy a sword in good polish and with Hozon papers from a reputable dealer.Many Japanese collectors will have only one sword and it is likely to be a signed ubu Koto blade with Hozon papers in old or new Japanese polish. Higher papers are thought to be a waste of money.Many collectors will also look at periods other than the Muromachi period when many swords were made in haste with little attention to quality and ready for war.That does appeal to some collectors but the chances of getting your money back are a lot slimmer. Having been on both sides of the fence I can't help thinking that it is six of one and half a dozen of the other when it comes to cost and to collectors preferences. The number of Saotome owned by our members would seem to indicate that perfection is also an objective in the armour world and the prices paid at the Ott auction is further confirmation if it is required.Good armour is certainly not cheap.I have a picture in my mind of one of our members cradling his beloved Bamen. In his eyes it is perfection and I would not disagree. A medium-sized birdie told me this summer that finding a genuine Muromachi Jidai (or older) sword in the U.K. is very difficult. Even more so is this true in France. They just do not come up in the marketplace. Against that, it sounds as if you might be onto a good thing, Dave. To answer the question, though: "In a trap?" Sword collectors in the UK? Re J swords in general this thread rings true for me too. Even though I live in Japan where shirasaya, papering etc., are relatively cheaper, and I go to sword meetings, the story is the same. Over the years I have found relatively few which tick most of the boxes, (approaching perfection, for me anyway). They are not easy to find, not cheap and go to sleep in a drawer except for rare sword-savvy guests. You can display the Koshirae, if you are lucky enough to have bought both blade and furnishings. I am not a sword practitioner, and my 'eye' is in its infancy. One person told me it takes 30 years of hard study to develop one. For me it will take more. A massive challenge and a hard nut to crack. Piers, the point I'm making is that its only the collectors that create these rules of perfection. I'm a swordsman and care little about the cosmetics of the blade. My concern is that we fall into this trap of passing judgement on armour that is not deemed refine or special. If we develop a culture where we falsly educate new collectors than only bamen or saotome are worth collecting then we exclude everything else as common junk. We have those that want to collect a particular smith, style etc, that should not be an issue, as each to their own, and it creates a knowledge base. What we cant allow is that level of collecting to become the driving force, nor papering become the norm. I own some very nice armours, I dont need a panel to tell me that and then pay them for a computer print out of their opinion. Nor do I want the market for my investment dictated too, that it should be so, otherwise it segregates collections. Sadly it is human nature to follow fashions, but by the same token it is often the case that what was once in fashion then falls out again until being 'rediscovered' by some influential authority. Maybe a Nagamitsu blade will have seen enough cycles that its reputation is rock solid, though. In the meantime we need to focus on what we like and why, whether we can afford it or not. You also get prices being driven up by speculative collectors who attempt to corner the market. Netsuke are a good example of this, and sword fittings too. In the West there is also a much stronger demand for paperwork, for whatever reason(s) than in Japan. Different philosophies and understandings moving the respective marketplaces? Perfection is an ideal that some - perhaps even myself - choose to pursue and we may not even realize the reasons why. However, even this ideal may change over time and remains in the eye of the beholder. I agree with Dave. Value is a difficult thing since there is different values. 1. One of my armors have a market value, what other people like to pay to buy it. This value fluctuate with fashion, supply and demand. 2. The armor can have a historical value as a piece of significans in the development of armors or by provinience due to who made it or owned it (then and even later..), that isn't or is reflected in the market value under 1. 3. The armor can have a value to me, because there are some kind of attachment, affection or other, that most definitly is not reflected in the market price under 1. Simple armors like kiku or tatami, uninteresting in the eyes of the big pelagic fish, are wonderful in the eyes of a bottom feeder like me. I enjoy collecting things like Saotome and such, but a nice odd zunari with zaboshi, gives me equal pleasure and thus are of equal value to me. Eveyone collects within our limits, for me value under p3. is the most important. Put another way: One man's perfection, is another man's irritation. All, Like Anthony and Dave I see a value (not financial but historic / technical / personal) in just about all armours. When I first started collecting Japanese items it had to be swords since armour in these parts was rare. I joined the ToKen Society and acquired a mass of swords but still hankered after an armour in its box. I soon encountered those types who think they are somehow superior by only collecting papered blades in shirasa. Can you imaging collecting helmets and ripping off the shikoro since that is the important part? To me a blade in shirasaya is not a sword - it is only part of one, no matter how many bits of paper are dangling off it. Many of those who pursue that course are really people who do not trust their own judgement and feel safer trusting the word of others. The pursuit of excellence is fine, and to some extent we all do it, but the people who I really admire are those who collect a particular armour or sword because they love it, not because someone tells them it is what they should buy. I have a sword I had polished and put back in its koshirae. 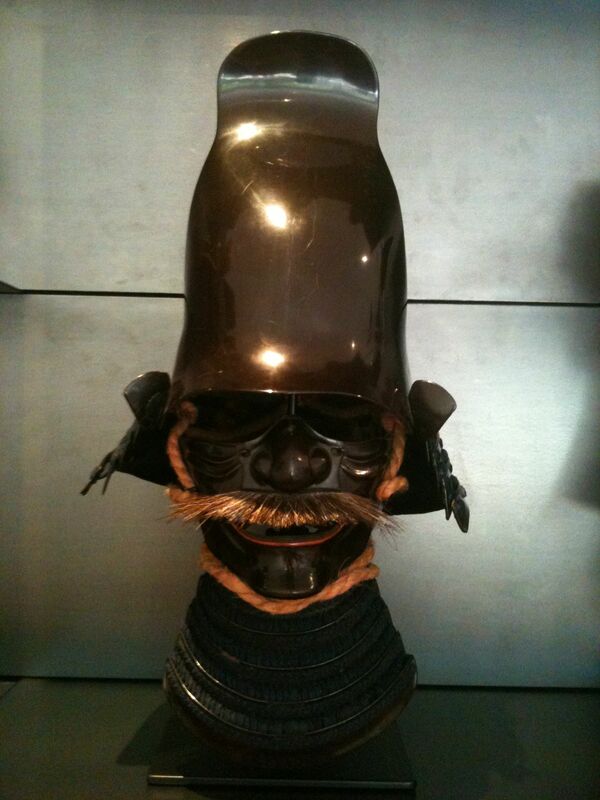 To me it is absolutely perfect - exactly what a real samurai would wear. To the so-called serious collectors it is just an unsigned run of the mill late shinto, Mino blade in iron mounts that match but not made by anyone special. I also have three armours that I would rank with some of the best, but I have others some would walk past without a glance yet to me they are all interesting. I feel sorry for those people - they are missing out on so much pleasure and delight. Buy what you enjoy from an aesthetic and historical viewpoint. For decades I was a serious firearms collector. While I was very specific in what I acquired, I did not limit it to a specific maker or type. My collection didn't have 60 Lugers that are only special due to the serial number range or factory stamping. What I did collected were examples of specific categories and time frames that interested me due to the engineering and history of each piece. I also pursued pieces of use exclusively. Good condition and correct examples but only firearms I could and did actually fire. The enjoyment of shooting a 98 year of sub-machinegun (the first successful example, forget what the Italian say) or the first example of a .357 revolver was to me the purpose of collecting. When I started collecting Indo Persian antique arms, I was limited to lower tier examples by economic necessity. While my purchasing power has increased significantly since, it gave me a wider appreciation for all types and quality levels or arms. I avoid parade or high end display pieces that grace so many collections, concentrating on pieces that better represent what was in actual use for their type. That is one reason why the Tatami guzoku suits interest me so much and I will find myself one in time. Arms and armor only have interest for me as examples of what they represented, the history they convey and yes the aesthetic and mechanical beauty they posses. Japanese swords I agree lend to the "trap" that Dave suggests. So many sources echo the perfection or trash concept. I nearly started down that trap but caught myself before entering the hole too far. If I cannot display and enjoy the blade for what it is then it has no purpose to me. Granted, I'm not going to slice fruit tossed by nuns...mainly because I'm scared to death of nuns, but I refuse to put the blades away in a drawer and move on to the next one. All pieces from the perfect museum piece to the rusted and cracked blade found in someones attic tell a story that is worth understanding. I fully agree with the previous speakers. I have never understood the charm in collecting swords which is housed in a shirasaya and then stored in a drawer. Like Ian said, a sword without mounts is not a complete sword. That the collectors in Japan does it is a bit more understandable. They fight against the humidity which would turn a badly kept sword to rust in a blink of the eye. My whole point is that so-called "perfection" is only valid for the person in pursuit of it because by its very nature it is a philosophical, aesthetic or curatorial ideal that is unattainable. We all have our idiosyncracies as collectors, which is why I'm always so interested in seeing the collections of others. Massimo has a soft spot for zunari, Jan for teppo, Uwe for Shimazu and Anthony for everything. A true collection should be a reflection of its owner - a cocktail of his/her taste, sensibility, knowledge, experience, pocketbook, quirks, motivations and commitment - not some assembly of "greatest hits" as determined by an auction house, the market or even some society of experts. Thank goodness we do not see the attitude here that is so common among some sword collectors. Time and again a new collector will post their latest treasure on a site and be blasted for buying rubbish and told to study books before they buy anything. This is exactly what puts so many off. A new collector needs something to handle and learn from. To them their sword is exciting, no matter how bad. A fellow member of the Northern ToKen bought a tanto with a strangely constructed tsuba. It was blasted by the 'experts' as a load of rubbish. After being polished and put through shinsa they were all strangely silent. John has exactly the right answer - buy what interests you (and what you can afford). What other people think is irrelevant. As a "Wannabe, but will never happen" collector, the common denominator I see , is disposable income.